Square Enix recently released some cosmetic DLC for Final Fantasy XIII - which, unfortunately, wasn't supposed to be available to the public. Exclusive DLC incentives are nothing new - heck, about half the games on Steam come with Team Fortress 2 bonus items - so you'd think that publishers would have the whole process pretty much locked down. Well, think again. A piece of cosmetic DLC for Lightning Returns: Final Fantasy XIII replaces Lightning's outfit with the iconic Aerith costume from Final Fantasy VII. This DLC was meant to be an exclusive unlock for buyers of a specific strategy guide, but Square Enix released the costume to the general public by mistake. The original deal between Square Enix and Japanese publisher Shueisha would have restricted the Aerith DLC to buyers of the V Jump strategy guide for Lightning Returns. However, Aerith's outfit was only one of three pieces of cosmetic DLC Square Enix published last week in Japan. 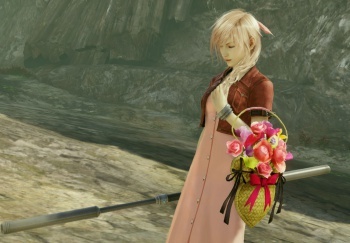 The other two costumes (Cloud's and Yuna's) were sold for 400 yen each, but Aerith's costume was mistakenly added to the store for the same price. The blunder was noticed a few days later, and all three items were pulled from the online store. Square Enix tweeted an official explanation and apology last night, and resumed sales of the other DLC costumes. "This DLC was available as an exclusive bonus to be released with a publication by Shueisha, but has been sold due to our mistake," the (translated) tweet says. "We apologize for the inconvenience to everyone and more than anything to our customers and to Shueisha." It remains to be seen whether this slip-up will have further repercussions for Square Enix.